The all-new Seat Arona, a rival to the Nissan Juke, can be ordered now with prices starting at £16,555. The Arona, due in UK showrooms from November, comes in SE or SE Technology forms at the entry level, with more aggressive-looking FR and FR Sport models next in the range. Top-spec Xcellence and Xcellence Lux trims will be the most luxurious models on sale, with prices starting from £20,825. To mark the car's launch, SE First Edition and Xcellence First Edition models are offered for a limited time, bringing more kit and bespoke design features to signal their place as at the start of the car's production run. Arona is Seat’s second SUV and third new car this year, slotting into a segment in which global demand has quadrupled since 2015. Its rivals will include other big-selling models such as the Vauxhall Mokka X. The Arona sits beneath the Ateca in Seat’s SUV range and is built on a compact version of that car’s Volkswagen Group MQB underpinnings, called MQB A0. The same platform is also used by the newly launched Ibiza and Volkswagen Polo superminis. Seat boss Luca de Meo said the firm is planning to launch six new models by 2020. He added: "We are in good shape. 2016 was the best year in our history, and we're 13.9% up again to the end of May this year. We're the fastest growing brand in the VW Group." The Arona’s design draws on features from the smaller Ibiza as well as the larger Ateca, adopting the latter’s underbody protection and rugged wheel-arch surrounds. Technically, the Arona is more closely aligned with the Ibiza, although it’s 79mm longer and 99mm taller, with raised ground clearance and improved head room. Seat has also given the Arona higher seats — they’re 62mm higher than the Ibiza’s — and thicker cushions, along with a more upright windscreen, to make the cabin feel more airy and commanding place to sit. There’s more storage space, too, with a 400-litre boot capacity that trumps the Ibiza’s by 108 litres and ranks the Arona ahead of its main rival, the Juke, by 46 litres. Up front, the car gets a familiar dashboard layout that houses an 8.0in touchscreen infotainment system, slim air vents that have been stretched to accentuate the cabin’s width and sporty dials. Power will come from a choice of five turbocharged engines — three petrols and two diesels. All drive the front wheels through a five-speed or six-speed manual, or a seven-speed dual-clutch automatic. The petrols comprise a 94bhp 1.0-litre three-cylinder that is mated to the five-speed gearbox, a 113bhp 1.0-litre triple that gets the six-speeder or automatic, and a 148bhp 1.5-litre four-cylinder, which has fuel economy-boosting cylinder deactivation technology and comes equipped with the six-speed gearbox. A hot Cupra version with the 197bhp 2.0-litre TSI engine also used in the VW Polo GTI could also follow. The sporty FR trim gets Seat’s four-mode drive programmes — Normal, Sport, Eco and Individual — for a wider range of drivetrain and chassis characteristics. The diesels are based on a 1.6-litre four-cylinder engine and offer 94bhp and 113bhp. The lower-powered version has a five-speed or automatic gearbox and the 113bhp diesel has a six-speed transmission. The Arona is offered with a wide range of trims and finishes, including 68 possible colour combinations for the body and roof. Technical features include driver assist programmes such as adaptive cruise control and auto lights and wipers, as well as a rear-view camera. There’s also a tiredness detection system and park assist. 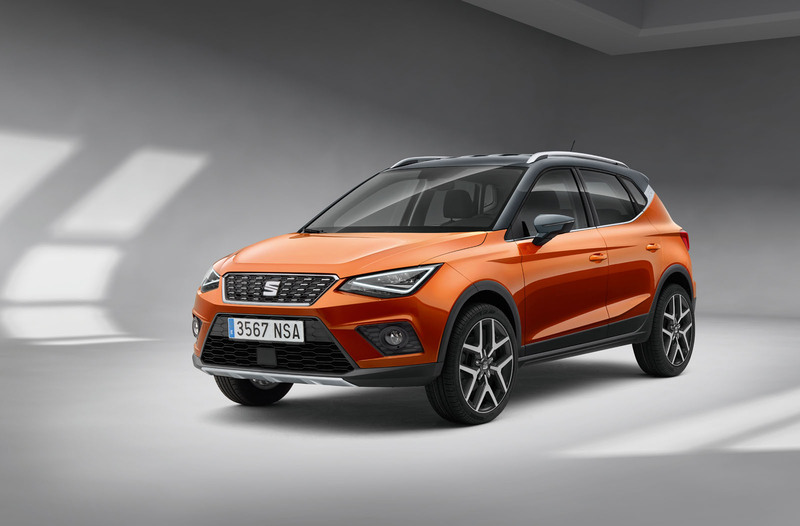 Seat is expecting such heavy demand for the Arona that it’s preparing its Martorell plant in Spain, which also handles production of the Ibiza, Leon and Audi A1, to ramp annual output up to 500,000 units. The Spanish manufacturer plans to continue its aggressive range expansion into next year, when it will introduce a third crossover. This larger model, based on the underpinnings of the Skoda Kodiaq, will sit above the Ateca in the range. Most predictable looking car of the year so far? Now this car's styling wasn't going to be predictable....not! If Skoda and VW come up with their version they'll look virtually identical no doubt. It's got a decent boot on it, bit of height for loading kids in, bigger than a supermini but smaller than a C segment hatch and the styling doesn't shout look at me. As an alternative to a supermini for a young family that might do the trick for many. Far more appealing to me than a claustrophobic, noisy Juke and easier on the eye than the recent Korean reveals, subject to seeing all in the flesh of course. I have to agree. It seems to be a particularly useful size, looks reasonable on the outside even if the glass house is a tad tall. Interior is smart, prices sound tempting and its got some excellent engines, especially the 1.5TSI. Combined with SEAT's recent habit of turning out good handling cars and they could well be right to expect heavy demand. Stunning! Commanding, rugged yet sporty. I do believe it might be available in a choice of two tone colour ways as well. So innovative and exciting. Not only will everyone who drives one of these have an active lifestyle but they will also be a true individual and free thinker. Aside from following the current fad for having a rear tick that reduces the rear window size (thus increases claustrophobia and the likeliness of car sickness for kids sat in the back), I like this car a lot. Has a good mix of practicality, looks and decent engines. Possible next car for me - unless Skoda bring out their version and for less cash soon. Agreed. It's a pointless design cliche that has no practical use whatsoever. Here Seat seems to be actually proud of it, so much so that it adds a chrome highlight (that looks like an afterthought) to emphasize the rising window line. Yes I lament the the thin pillars of the of the Austin Metro, Ford Cortina, Lambo Jarama and the BMC Pacer. Children always felt less car sick in a Ford Cortina. You could always buy a VW Sharan. I agree with the comments on silly rear window kinks so the poor old kids get less light. But at least on this Arona it's a fairly low kink and the door handles are in a decent place so young kids can open their own doors, unlike Juke/CHR/Swift etc etc with door handles closer to the roof! I may well look to buy one of these Aronas. Living in an SUV World....? Can't help thinking we are getting pushed towards this type of Vehicle,most are yummy Mummy Wagons,never more than one plus Child,they aren't used in most cases by definition as a do all Car.